Home » Partners in Haiku » Guerilla Haiku Goes to Cleveland! The Cleveland Public Theater (CPT) is one of those regional theaters that fully embrace their commitment to serving the needs of their community. And the Gordon Square Arts District is the multi-organization consortium (including CPT) that is revitalizing the Detroit-Shoreway neighborhood of Cleveland. When Executive Artistic Director, Raymond Brobgan, contacted Guerilla Haiku in February to invite us to their yearly Party in Gordon Square to engage their Party-goers in Haiku-ing, I jumped at the chance. 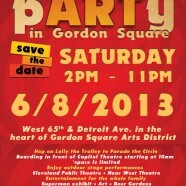 What better effort to support and celebrate but the coming together of a neighborhood around Art? Stay tuned for a full photo blog post about the event itself, and take a moment to check out the amazing work that the Cleveland Public Theater is doing in their city. Be inspired!